A New and Accurate Map of the South West part of Germany. Comprehending the Archbishoprics of Mentz and Treves, the Electoral Palat, of the Rhine, Duchy of Wirtemberg, Franconia, Swabia, Alsace, Lorrain etc. 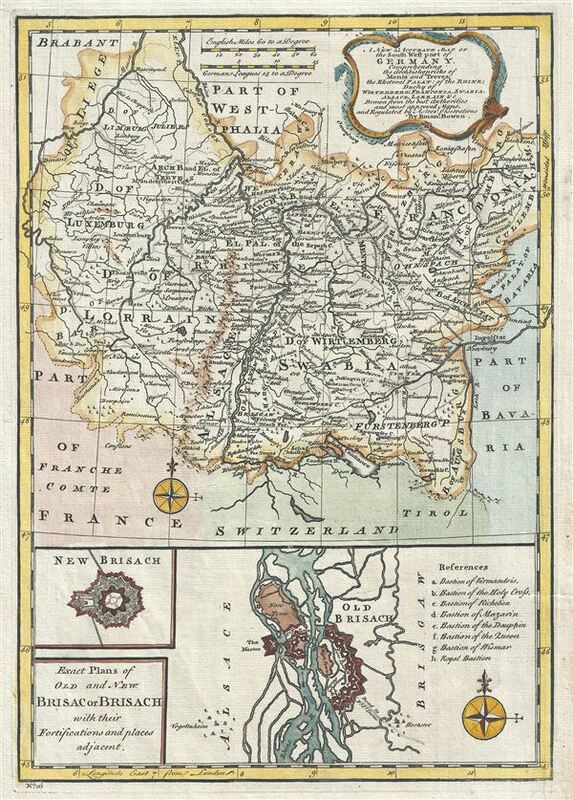 This is beautiful 1747 map of the southwestern part of Germany by the British cartographer Emanuel Bowen. It covers the southwestern parts of Germany along with parts of modern day France and Luxemburg. The Duchy of Luxemburg, Wirtember, Swabia, Alsee, Lorrain, Franconia, the Archbishoprics of Mentz and Treves, and the Bishoprics of Augsburg, Bamberg, etc. are also included. Cities of Luxemburg, Metz, Nancy, Strasbourg, Basel, Ulm, Baden, Mainz, etc. are noted. Includes the important mediaeval and renaissance center of Nuremburg. Today Franconia is a historic district and has been consolidated with Bavaria. The bottom half of the map includes a large inset detailing the 'Exact plans of old and new Brisac or Brisach (Breisach), with their fortifications and places adjacent.' Situated on the Rhine River Breisach changed hands between the French and Holy Roman Empires during the late 17th and early 18th centuries. The inset details forts and roads, with a reference along the right margin. New Brisach is detailed in a smaller inset above the title. Throughout the map notes several towns, cities, rivers, lakes, roads and a host of additional topographical features, with mountains beautifully rendered in profile. A beautiful title cartouche is included in the top right quadrant. This map was prepared by Emanuel Bowen as plate no. 16 for the 1747 issue of A Complete System of Geography. Rumsey 3733.015. Philips (atlases) 614 (1752 edition).